Somebody built a nice concrete walkway for the AT under PA 443 through this little culvert. Then fifty feet downstream, instead of using the culvert to cross the stream, there were a few lousy stepping stones in place - until nature provided a new ad-hoc footbridge, which the maintainers glommed onto like flies to a new pile of dung. Well, they make you cross busy PA 443 again just a half mile later, this time scurrying frantically to avoid the traffic (it boggles the mind). But then the tension melts away. You know I love meadow walks. This one, approaching Second Mountain, was a nice one. Second Mountain ... meh. For Southbounders there was an unusually steep climb up to it ... by PA standards. 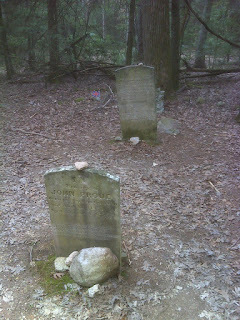 Then an old woods road leads you more gradually down the other side to this cemetery at the ghost town of Rausch Gap - pre civil-war. Rausch Gap puts this part of Pennsylvania's serious environmental problems on full display (Have you heard about Centralia, PA, where a coal mine fire beneath the town has been burning continuously since 1962?). 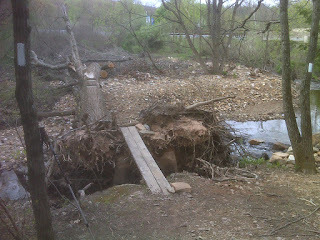 This is a collapsing railroad bridge over Rausch Creek. 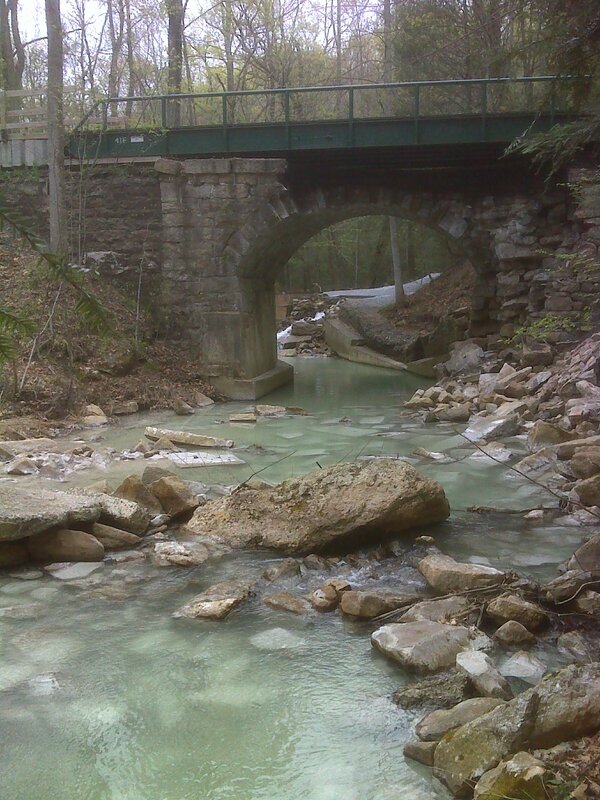 The white in the water is limestone sediment coming from a treatment well - deliberately put there. They divert the entire flow of the stream through a bed of limestone to reduce the acidity caused by runoff out of the old mines. The Rausch Gap Shelter,on the other hand, is a delight. It's scheduled to be replaced from the foundation up before September 1st, 2012 - all the amazing old stonework will be untouched. 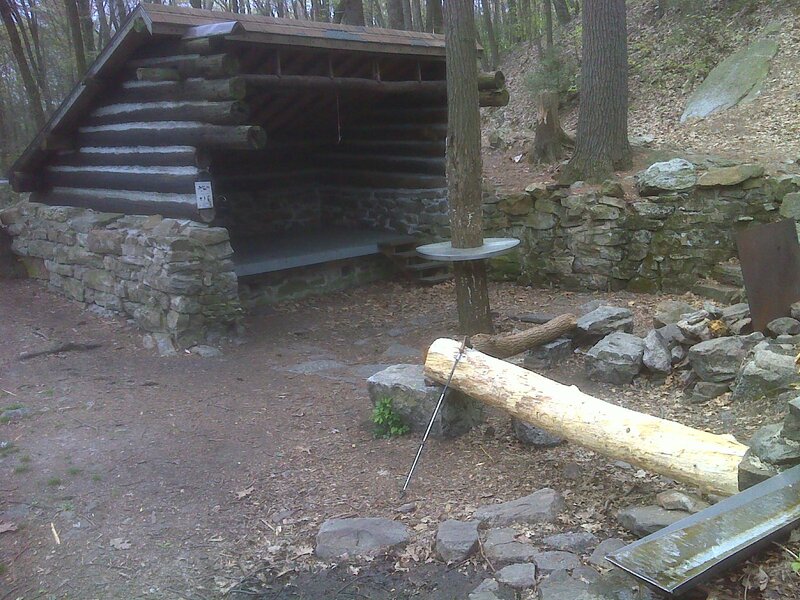 I sure hope the new shelter has this much character - in keeping with its stone foundation, the rock wall and stepwork, and the built-in piped spring. It's a place you just want to settle into and live! On south is a gradual ascent up Sharp Mountain to my turn-around. Straight, somewhat rocky walking, quick and featureless, just like yesterday. 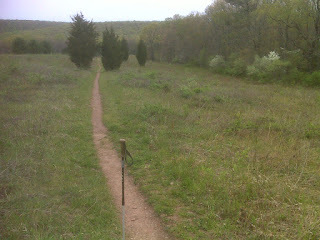 I appreciated Sharp Mountain just for its easy trail. No photo of my wandering thoughts and daydreams - only possible when the trail is easy and monotonous - fun to make time through, but not the stuff of legend. 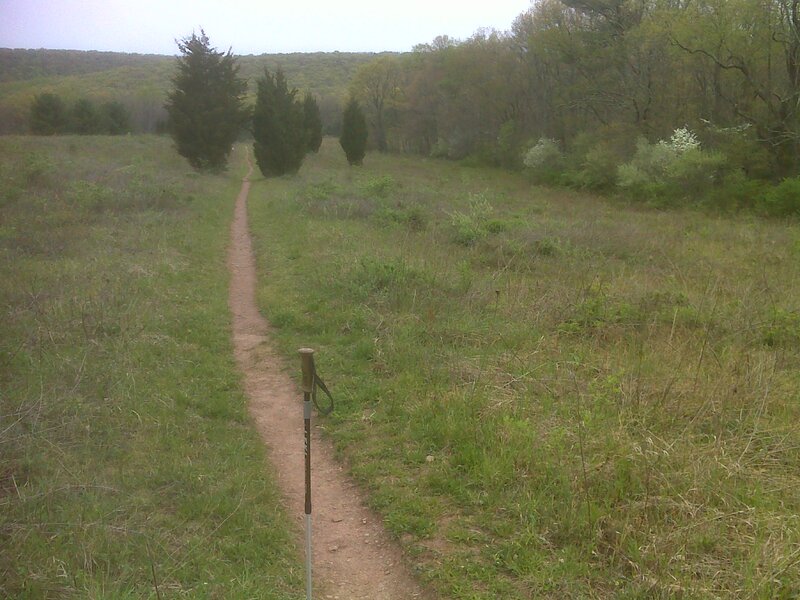 So the next bit of variety had to wait until I covered new trail south of the PA 443 parking area. There's a pretty walk through a 'boulevard' of young trees and overgrown meadows. Apple trees were blooming and showering the trail with their falling petals. 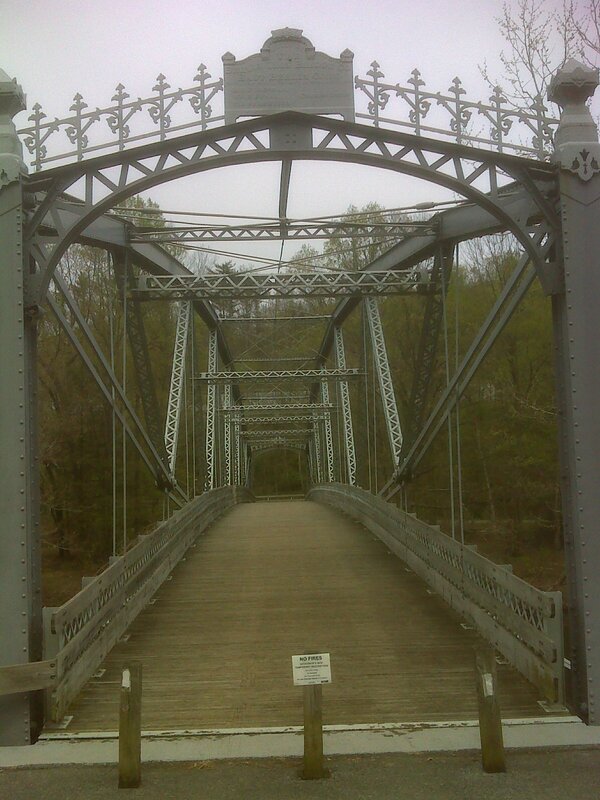 Then you reach Waterville Bridge, moved here from Lycoming County for the AT to cross Swatara Creek in the 1980's, built in 1890. From there you go under I-81 and climb up to good ol' Blue Mountain (named for the hiking club, right?) I turned around soon after taking in this vista of I-81 and the truck stops at Lickdale. I was hiking all day. So I'll sleep well tonight.